Since the industrial revolution, the world has witnessed the rapid expansion of its metropolises. Most in this world want development. For many people of developing countries, building tall tower houses, wide roads, flyover, easily accessible market, cars and motorbikes means development and they have been flocking to urban areas in search of jobs, commodities and entertainment. Day by day, the demands of humans are increasing and so is the urbanization. With rapidly increasing urbanization, the cities have seen unpredicted growth in dependency of motor vehicles and fossil fuels. This ultimately result in traffic congestion, road accident, air pollution, and high emission of carbon, global warming and climate change, which lead to significant economic and environmental loss. Living in clean environment is the right of each and every citizen but according to World Health Organization estimation of year 2012, around 3,700,000 premature deaths a year were caused by outdoor air pollution. People residing in 7 out of 10 cities in Asia, breathe unhealthy air. A 2013 assessment by WHO’s International Agency for Research on Cancer (IARC) concluded that, “outdoor air pollution is carcinogenic to humans with the particular matter component of air pollution most closely associated with increased cancer incidence, especially cancer of lungs”. If we compare between pedestrian/ cyclist and car owners, definitely we will find that pedestrians and cyclist inhales high amount of dust particle than the car owner. This means every pedestrian and cyclists are fighting for their life, and the question to be raised is; where is their right? If we look at the history of environmental conventions, it can be traced back to the 1970’s. The 1972 United Nation Conference on the Human and Environment in Stockholm signaled the start for active international cooperation. Till now 20 sessions of COP have been organized and COP 21 is taking place in France, Paris. Rio summits were organized in 1992 and 2012. Unfortunately nothing special has happened. It’s good that we had very good discussions there, many scientists presented their reports, many policy makers argued on their agenda. And do you believe, we are content that we have very good documentation of declarations and reports? No we aren’t, we want action!!! “To think is easy, to act is difficult”. The words by the German poet Goethe encapsulate the essence of proper study before sketching anything. But the city planner often predicts lightly about the future and city ultimately become unmanageable. At this moment, the world’s population is above 7 billion, the urbanization is about 50% which means almost half of population is living in urban areas (maybe mention how much land area cities occupy) and it will be more in near future. Therefore, still applying conventional approach of “predict and provide” is not a good enough solution to address urban problem and to control the premature deaths. These two stories are just an example. Thousands of other cyclists are facing the similar problem every single day. Thus, walking and cycling in the road is becoming a hidden tragedy of life. Every day people are dying because of air pollution and road accident. 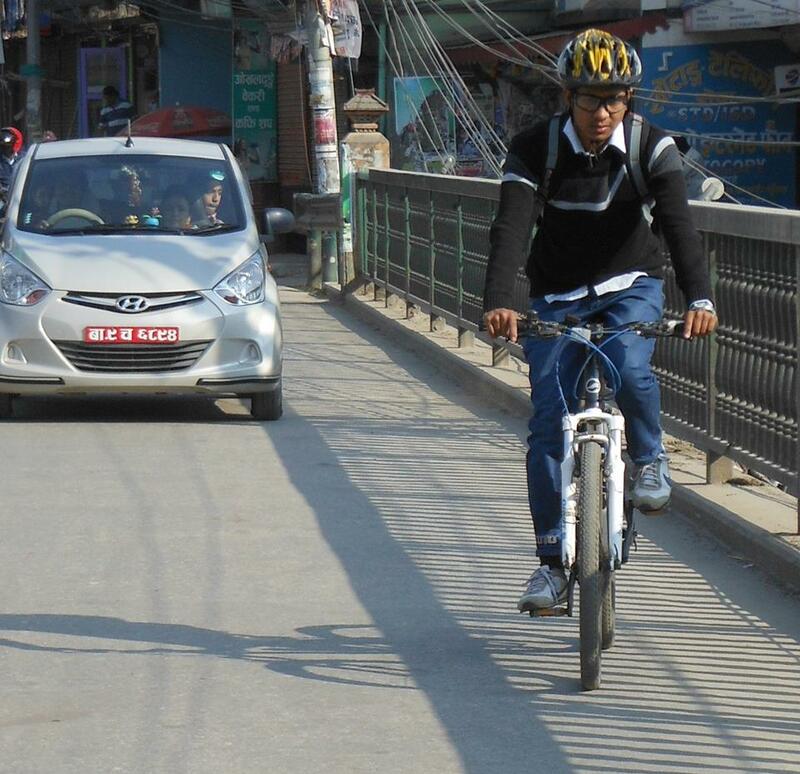 Widening road and making flyover always promote cars and motor bikes not walking and cycling. Although they have the equal right to live longer, unlikely people residing within 50 meters of highways and busy roads are suffering more from road accident and health problem in comparison with others. Low income family, children and women suffer from both private and public vehicles. Low income people cannot afford own vehicle and they have the choice either to walk or use public vehicle. In many countries like in India and Nepal women have to often encounter sexual harassment inside bus and minibus, this also shows the condition and services of public transportation’s. Therefore it is the need for paradigm shift from vehicle centric to people centric transport system. Now it’s time to focus on affordable, equitable, comfortable, secure and environment friendly transport service. It is urgent to give priority for walking and cycling. Improving road capacity alone may not be helpful, urban mobility plans need be revised and government should give priority to public transport and all the city should go for Bus Rapid Transit (BRT) System. Let’s improve our city, it’s our home. Do not hesitate, come and join. Let’s move people, not cars. « Will Hanoi people take the Metro?